Having already conquered space, American business adventurer Elon Musk has his sights set on the sea. 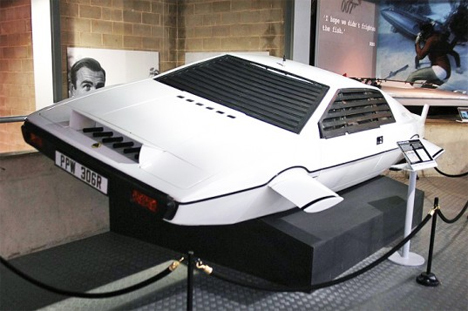 He recently bought the undersea vehicle from the 1977 James Bond film The Spy Who Loved Me, a Lotus with wings added for faux aquatic travel. Although merely a prop, Musk plans to add what’s necessary to make it a functional subaquatic vessel. Famous for founding electric vehicle company Tesla Motors and space travel company SpaceX, Musk is no stranger to exploratory adventures. He plans on adding a Tesla drivetrain to the white Esprit. Inspiration hit when he learned that, after dropping nearly $1 million on the prop, it didn’t actually perform as it does in the film. If successfully launched, we predict he’ll wear a tuxedo and, although the original was piloted by Roger Moore, do a bad Sean Connery impression. See more in Mods & Custom or under Transportation. November, 2013.